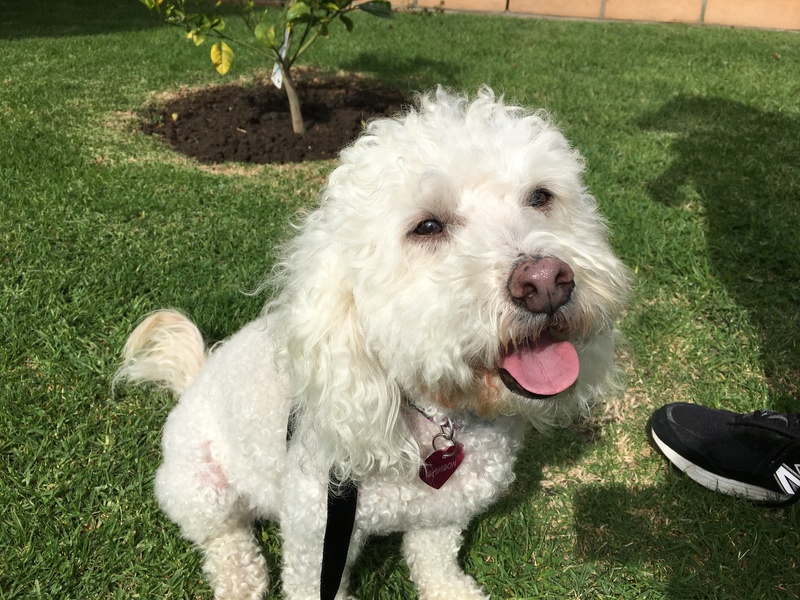 Samson is a four-year-old Bichon who lives in Beverlywood, California. His guardians booked a dog obedience training session with me to stop dog aggression when on walks. While he was mostly just excited, Sampson did give me a tiny glimpse of territorial behavior when I arrived for the session. As I mentioned in the above video, picking a dog up while greeting someone at the door can actually confuse the dog into thinking that you are rewarding it for barking. A better tactic would be to walk towards the dog briskly and not letting it get around you. This allows you to back up the dog until it is a good 10 feet or so away from the door. Then by taking steps backwards while facing the dog, the guardian should be able to communicate that Sampson needs to keep his distance and let the humans handle door duty. I said down with his guardian to get more info on the dog and discuss what she wanted to accomplish during the session. In the course of that conversation, she brought up the fact that Sampson used to mark in their house and still sometimes does at other houses. I wasn’t quite sure if Sampson was marking or having accidents so I spent a couple of minutes going over some remedial potty training tips. Now if the problem is marking, then the solution is not a remedial potty training overview, it’s changing the dog’s perception of authority. When a dog urinates on things, it is doing so out of an assumption that it has the authority to claim things. This often is a result when a dog lives in a home with few limits or boundaries. I suggested some rules and boundaries for the guardian to incorporate such as asking Sampson to sit before letting him in or out of a door, not being allowed to be within 10 feet of any human who is eating and no jumping up on humans. I also suggested that the guardian start to practice my petting with a purpose strategy. I detail hw to do so in the video below. By asking the dog to sit, come or lie down before anyone in the home pets it, the guardians will be able to help Sampson start to see them as authority figures and himself as being in the follower position. Once a dog sees itself as a follower, they start listening better and following rules and limits on their own. Next I shared some nonverbal communication cues that the guardian can use to disagree with Sampson anytime he starts to get into trouble or break any of the new rules. Because I derived these from observing how dogs interact with one another, Samson understood and responded to them immediately. Now that we had addressed discipline and structure in the home, we were ready to tackle Sampson’s issues while outside while on walks. As I like to say, the dogs behavior on walks starts inside the home. Many people mistakenly continue when their dog is over excited during the leashing process. But the energy your dog has inside the house before you leave on the walk is the same energy it will carry with it through out your journey. So anytime that Sampson starts to get over excited when his guardian goes to apply the leash, she should stop and wait for the dog to return to a completely calm state of mind before continuing. Before actually leaving the house, I fitted Sampson up with a martingale and showed his guardian how she can apply the special twist of the leash to give her more control while on the walk. But before we headed outside, I spent a couple of minutes going over some basic leash training. By helping the dog practice not running through the door as it swings open, we can help it start to adopt more of a follower’s mindset. Additionally this sort of exercise will help the dog start checking in with its guardian rather than rushing ahead and paying them no mind. Once we were out on the street, I took the leash and demonstrated the proper way to hold it and lead or correct the dog while on a structured walk. Sampson resisted a bit at first as he clearly preferred the harness that gave him the ability to control his guardian rather than the other way around. But after a minute or two, he seemed resigned to accept the new collar and leash and started walking normally. Once that was the case, I handed the leash back to his guardian and we headed off for a short walk around the neighborhood. It was great to see Sampson walking in an almost perfect heel position next to his guardian moments after leaving for this walk. Prior to this session, Sampson was all over the place; usually lagging behind his guardian or off to the side. By communicating what we do and don’t want from our dog and taking a little bit of time to go over some leash training, both the human and dog were now on the same page. Helping dogs and humans communicate better is key to any dog training or behavior session. When we returned to Sampson’s home I was quite pleased with his reaction to the new techniques that we had introduced. However, we did not encounter any other dogs while on a walk. For approximately half of my clients, incorporating rules, boundaries and structure in the house result in a reduction or stoppage of dog aggression while on walks. But in case Sampson is not one of those dogs, I spent a couple of minutes showing his guardian a focus exercise that will enable his guardian to redirect his attention while on walks. Teaching a dog to focus can be an incredible effective tool to use for reactive dogs. The focus exercise is extremely effective when the human introduces it properly. The key is to practice it inside the house in a calm and quiet setting until the dog has mastered the basics of the exercise. Only then should the guardian start to incorporate distractions and practice it in varying degrees of more challenging scenarios. By the end of the session, Sampson seemed to be listening to his guardian faster and responding to her commands quicker. If the guardian can consistently pet the dog with a purpose, correct or reward him within three seconds and make sure that he is in a calm and balanced state before leaving for walks, Samson should be able to adopt these new behaviors on a permanent basis.